Gold Rated Condo/Locally Owned/5 Min to Lift and restaurants/2 Min to Hot Tub, swimming pool and tennis - complimentary with our condo! Brand new queen bed ready for your comfort. New dishes and kitchen items for your cooking pleasure. YES WE WILL PRORATE....Hello and welcome future renters. My hope is to make your life easier by having a flat rental rate of $215/night-with an $80 cleaning fee. No additional fees or confusion. Just let me know you are interested in that with your inquiry. If you are wondering the exact location of the unit, we are at 7120 N. Rachel Way. The building can be seen on google maps so you can figure out where we are in proximity to your activities. Also, if you arrive after hours, not to worry, our reservation management company, Jackson Hole Resort Lodging will take care of you. Just arrive at their location and instructions will be found to get the keys when the office is closed. We take care to make sure our unit is ready for your arrival and use a professional cleaning crew and management company to help us while you are here. They are available 24/7 for emergencies. In addition, we live in town and can help with questions about Jackson, Teton Village, Grand Teton National Park, Yellowstone, etc. Get the confidence of renting from a licensed Wyoming real estate agent when you book with us. One owner works for Rare Properties of Jackson Hole and is an active buyers agent. We look forward to your arrival. 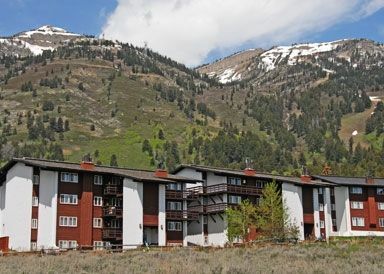 Our gold rated condo is perfectly suited for your visit to Jackson Hole for winter skiing, summer biking, fall color, or spring animal viewing. You have a choice of where to stay in Jackson and as frequent VRBO renters we hope to provide you with the easy-in and easy-out visit that you want while on vacation. If you are coming to ski, the great thing about our condo is that you can walk to the lifts (5 minutes, we do it every weekend), or wait for the free shuttle which operates all day. There is a ski locker for your use and free wireless Internet access in the unit to keep in touch while you are away. As guests of ours, you also have access to the Sundance Swim and Tennis club where you will find 3 tennis courts, outdoor heated swimming pool, children's pool and two hot-tubs (one adults only). The club is located across the street/walking distance from the condo and has changing rooms onsite. (This is an owners club and the condo must be on the member list for access). In winter the pools and hot tubs are open Dec. 1-April 4th 2:00 PM-9:00PM for apres ski. Our condo is part of the Jackson Hole Resort Lodging program (thus its gold rating) (...and our photos are shown on their website...) Our condo features western style furnishings and a newly remodeled kitchen and bath with everything you need for your ski or summer vacation. We live nearby and can answer questions about the area, suggestions about restaurants or any other information you may need. We can't wait for you to visit this beautiful area that we call home. Our condo is super comfortable and inviting - the perfect cozy retreat at any time of the year. Disclosure: Owner is a licensed real estate agent in the state of Wyoming. Should you have real estate interest in or near Jackson Hole, please send an email. Yes, that is our son, Bennett who skis with the Jackson Hole Ski and Snowboard club and will be competing in April 2019 in the USASA Nationals in Copper Mountain CO. Holly and Matt are local Jackson residents and along with their rescue dog Coda, live year round. Holly is a real estate agent with RARE Properties of Jackson Hole. Matt owns a technical support company, Relief Technologies. It is absolutely beautiful and a perfect location to visit the ski area in winter or the national parks in summer. If you want to fly fish, the Snake River is minutes away. Although there has been construction in the area, we hope that the worst of the building is behind us. Recently we have updated the unit with a brand new queen mattress and new kitchen items. These items will be ready for our summer renters. Contact us today for immediate reservations. Quiet, great views of the mountains, walking distance to the Sundance Swim club with pool, tennis and hot tub, private parking. Sundance is across the street and there is a changing room available for your use. Jackson Hole Mountain Resort - world class skiing and snowboarding in winter, awesome hiking, fly fishing, mountain bike in summer. Faces Sleeping Indian and alpenglow sunsets. Extra towels under the sink. Shared with others in the basement - coin operated. 2 couches, one is a pull out. There are some spices and things in the unit available. Full service kitchen, full size oven and 4 burner cooktop. All available utensils, pans, etc. Coffee pot, toaster etc. Small sitting area outside of the doorway. Nice grassy area at base of building for kids to play. Summer kayak and canoe rentals are available and there are many places to rent. Mountain bike rentals are available at JHMR and lift access can be purchased for the downhill course. We do not have bikes in the unit to provide but rentals are an easy 5 minute walk. 3 tennis courts are available with a 2 minute walk of the unit at the Sundance Swim club. The courts are outside and racquets and balls are available to rent. There are 2 golf courses within 3 miles of the unit - Teton Pines and Shooting Star. 5 minute walk - heated in summer and winter. Small baby pool available for little ones. Tennis courts available in summer. Swimming pool and hot tubs available in summer and winter. These are shared across the street from the building and available to this unit as we are members. This is a perfect condo for a ski vacation. Location is great, and we especially appreciated the welcoming committee of 2 Moose in the parking lot. There was only 2 of us staying in the unit, but it could easily accommodate 3 and maybe even 4 if needed. We came to Jackson Hole to ski, and were particularly concerned with getting to the slopes quickly. From the condo you have multiple options. In the morning, you can grab the shuttle (comes every 15 minutes) going in either direction, and take it either to the Moose Creek lift or the mountain base. You can also walk down Michael drive to the Moose Creek lift. At the end of the day, you can get back to the condo by skiing to the Union Pass lift, ski through the trees to Holly Drive, and if there is enough snow you can actually ski all the way down to the condo. I wouldn't call it ski in/out, but it was easy to get out in the morning, and super easy to get home in the afternoon. The condo itself was well appointed with a well stocked kitchen and plenty of linens. Hot tub is available across the street, but was a little crowded when we were there. We had a good laugh at the over sized key ring for the ski locker. I would recommend they switch to a combination lock, but this is hardly a big deal. If you are planning on skiing, we were able to get a good discount on lift tickets through Jackson Hole Resort Lodging. Overall, we were very pleased with the condo, and look forward to returning soon. It is clean but there is nothing in the kitchen but chipped dishes, few pots, toaster that doesn’t work well and Mr. Coffee with no filters. The condo above had many college age kids who partied until 2 or 3 AM. There was a lot of snow which made parking understandably difficult but no one shoveled the path and steps to and around the condo and it was not unusual for people to fall. Nice condo in a beautiful location. The condo was clean but the kitchen could have been slightly better equipped -- the bare necessities are available. The bed in the bedroom desperately needs replacing. Summer renters beware - the windows are quite small and there is no cross ventilation. We happened to be there on some hot days and the condo did not cool down until early morning. Like other recent posters, we were frustrated that the owner did not disclose the construction going on feet away from the front door. The owner also failed to get back to me with a very simple request to receive the cancellation policies in writing. We hope to return to Jackson Hole again and would stay in Teton Village but would try to book a different condo next time. Clean and good location on Moose Wilson Road. Perfect for our time in Grand Teton National Park. This is a older unit but clean, good location, well stocked and within walking distance to the main village. Looks nicer than in the pictures shown. Note there is no elevator so you have to carry your luggage up several flights of stairs. Quite comfortable. Typical ski condominium which has all the amenities needed. Would stay here again. We are located at the south entrance of Grand Teton National Park within the Jackson Hole Mountain Resort. You are a few minutes drive to hiking trails, interpretive center, animal viewing, and anything else you may want to do in Grand Teton National Park. Of course getting up to Yellowstone is a beautiful drive up through Grand Teton National Park. It takes approximately 1.5 hours from Jackson to the entrance of Yellowstone. We are the closest location to the south entrance of Yellowstone (there is no town closer to the South entrance). While in Jackson and Teton Village, you must go up the tram and hike around the top of the mountain. If you are here in the winter grab waffles in the Tram restaurant at the top. In the summer, enjoy some hiking on the back side of the mountain and the wildflowers that are out only in peak summer months. Whitewater rafting is a great family activity and Jackson Hole White Water is a great company to take for a trip down the snake river. The scenic trips are also awesome and you are sure to see Eagles and sometimes the endangered trumpeter swans. You can also enjoy fly fishing for cutthroat trout. There are many other activities and we can provide suggestions if you are interested. For rentals longer than 3 weeks contact me for special pricing. Cancellation must be made 60 days from time of arrival. Email me for off season or last minute specials. Off season includes the months of April-May and mid-October - mid-December.